Notes/comments: This turned out rather more mixed media than planned, due to me trying to salvage the image from the completely blotched state that was the result of a supposedly water-resistant ink being quite soluble in specific circumstances after all. So it looks rather different from what I imaged, and not nearly as nice as a promising pre-blotch inbetween state did (which I unfortunately didn't scan), that had more texture and scratched gradients, but the black ink dissolved when I tried adding the color highlights and thus the ink ran into them. Also as usual the scanner didn't actually scan the colors as they are on the paper, though I tried to correct it as best as I could to compensate for that piece of color blind crap. Um, well, I usually try not talk this much about everything that went wrong (it doesn't give a good audience bias) but this was a very frustrating evening, and I can't help the venting. I've read both six issue series falling under this umbrella, i.e. Batman & The Monster Men and Batman & The Mad Monk. From what I've heard these are supposed to take place after Year One, but before that new Joker origin story that I haven't read (yet), but as I've said before, it is kind of tricky to make the overcrowded timeline of Batman's early career work, so I found it best not to worry too much. I liked this one. The combination of the mafia story with the creepiness of Hugo Strange worked well for me, and Strange made a good foil for Batman. 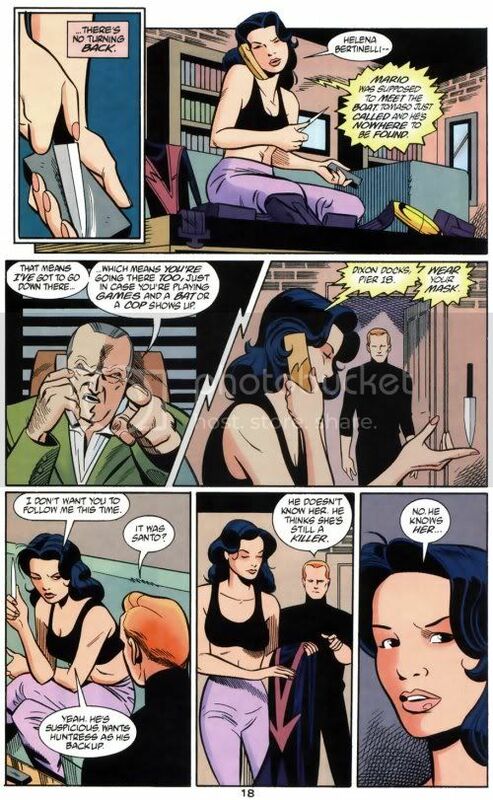 I liked Bruce's girlfriend, Julie Madison too, and how she gets frustrated and suspicious with him. Also, I just <3 the younger Jim Gordon, because among other things his expression when he says to Batman: "Giant mutant cannibals... you... you're serious?" was priceless. The poor guy will get used to a lot through his association with Batman over the years. 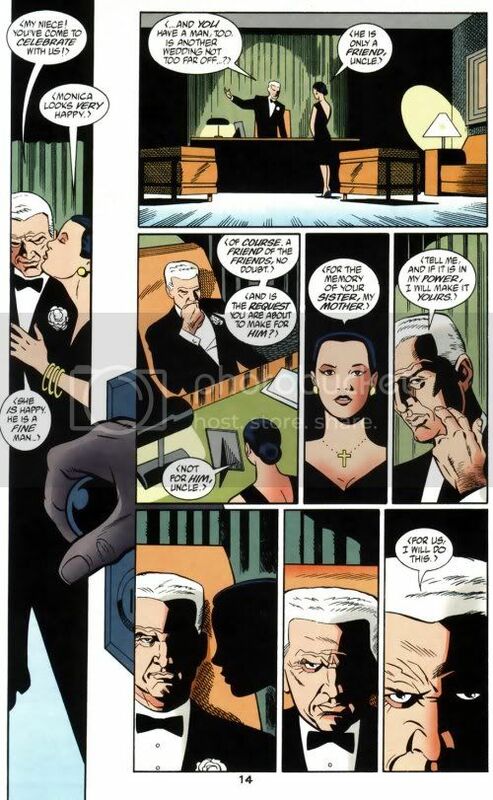 Alfred's dry humor is great here, e.g. : "And so, in keeping with conventional wisdom, you've chosen to secretly drug your girlfriend." And not that I'm complaining exactly, but-- wow, this was rather more bloody than a usual Batman comic. 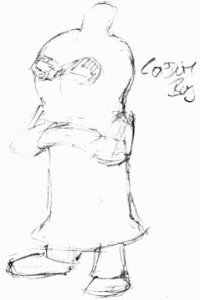 So you should probably avoid it if you have problems with gore, but otherwise it's a good read. 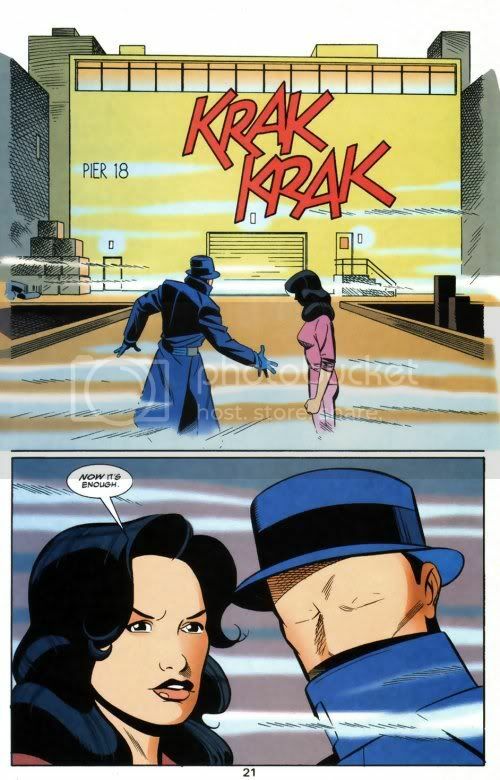 This is also a mix of Batman vs. mafia and an encounter with the "new kind" of creepier villain. I liked that Batman worries whether he inspires or encourages the costumed villains. True, that angst is somewhat of a classic theme, but it works for me. 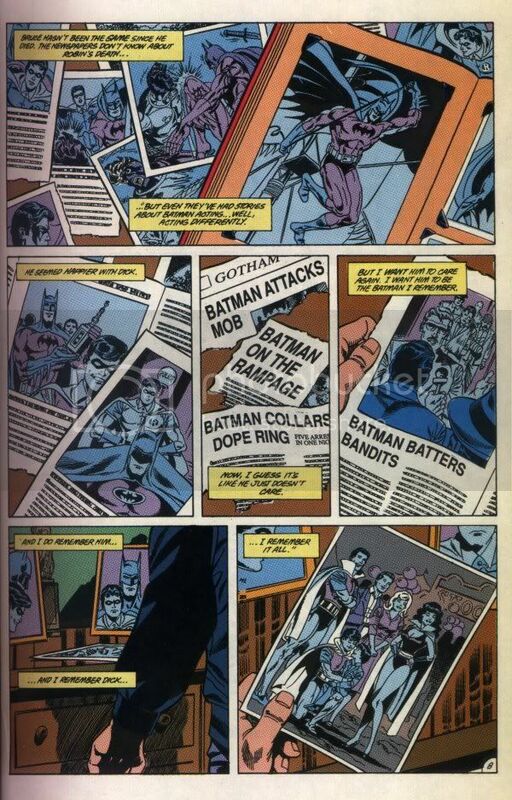 I also enjoyed the tension that comes from Gordon still working within a widely corrupt police force, and that Batman was shown doing detective work. 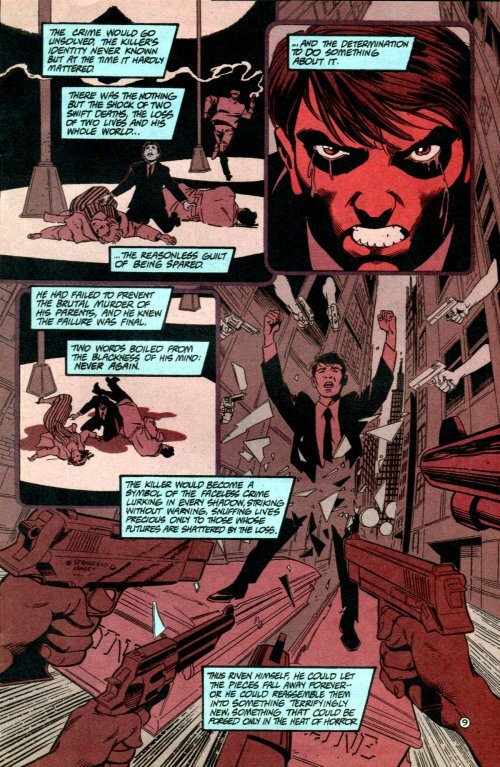 To get some nod to the pre-Two-Face Harvey Dent was pretty cool as well. I found Norman Madison's fear of Batman quite believable. However the (fake?) vampire cult didn't work as well for me as Hugo Strange did in the first series. While it was plenty gruesome, it just didn't build up as much terror somehow as I would have expected with the threat to Julie and the whole bunch of injuries Bruce suffers while fighting them. Still the plot overall was engaging enough, and some of the scenes in the castle were bizarre yet worked. Anyway, I enjoyed both series but liked the first better. This was pretty good. 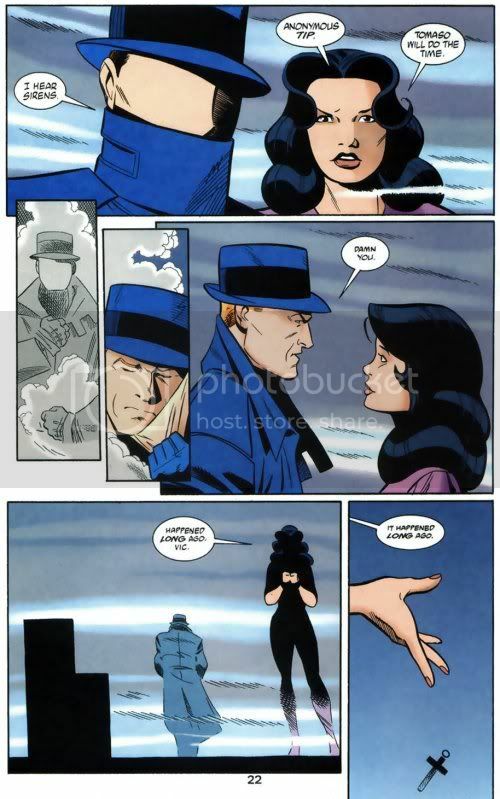 I really liked the art, and I actually recognized several panels from icons I've seen around, so I guess I'm not alone in my fondness for Murphy's art. I'm a bit tired of yet another psychopath getting a cliched backstory with an evil mother (or rather grandmother in this case) figure warping him, aided by the ubiquitous bullies, at but least the specifics of his case with the birds were rather cool and creepy, and I liked the Scarecrow overall. 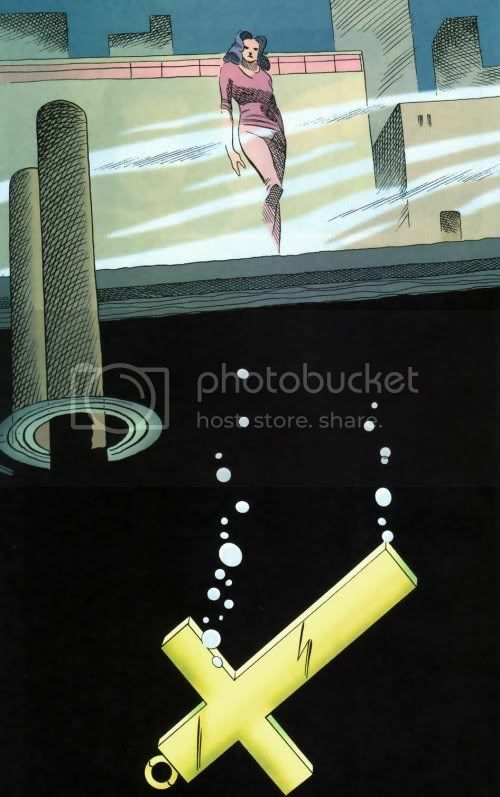 In particular I liked the visual parallels between the young proto-Scarecrow's defining scene with the birds swooping down on him through a broken skylight, and the typical iconic panels in Batman's origin stories of bats coming down on young Bruce and such. That nicely sets up the following scenes where Bruce angsts about his similarities to costumed villains dressing up as something scary. 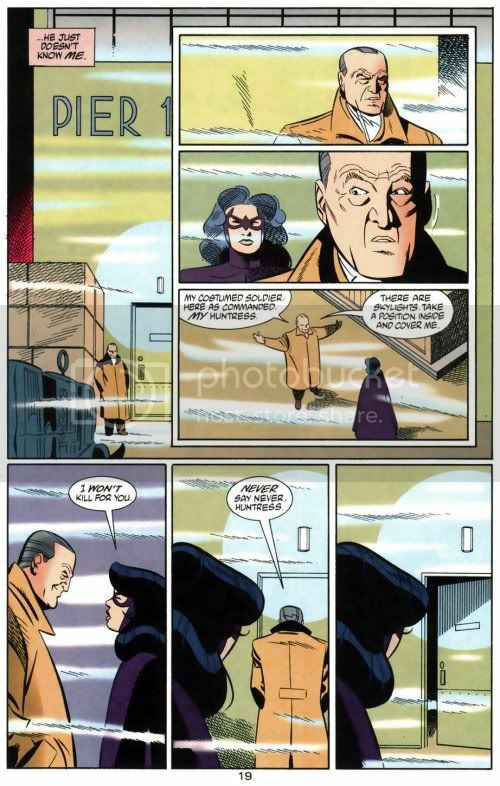 I also liked that this story, despite being set earlier, already includes Robin, though it would have been nice if Alfred had been present as well. 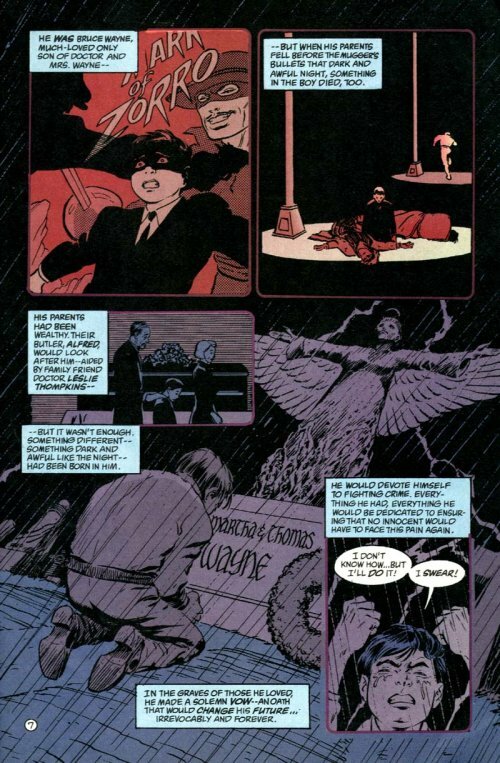 Also it seemed that for information gathering purposes this particular early version of Batman could have used Oracle's talents with the way their investigation progresses. But I didn't mind that much, overall the plot was okay, and the art and atmosphere made the comic as a whole really enjoyable for me. First, the whole Harry Potter thing is making me jittery. I haven't sought out the leaked copy because I'm not about to slog through hundreds of pages as crappy photographs, that's just unpleasant for reading. Not to mention that I don't really reread the HP books, so I'd rather read it the one time as proper book. But it is hard to keep away, knowing other fans have already read the book and are talking about it, even though my f-list is good with not spoiling me so far. (*insert the obligatory dire threats here*). I will only get my copy on Saturday and I'm not the fastest reader, so at the earliest I'm going to talk about Deathly Hollows on Sunday if at all, and then I will of course use cut-tags and be very careful not to mess them up accidentally. For the sake of my sanity I didn't even try to figure out why this is published as "Year One". I don't think this is supposed to fit in Batman's "Year One" or even just his early career, but rather after Batman: Death and the Maidens? But I don't have Ra's al Ghul's backstory that present. Maybe it is because of some flashbacks in the comic, and those could be made to work somehow in his first year. First, while the basic idea that the Lazarus Pits affect death and life's balance in general was neat (even if what exactly their connection is was never really explained in any remotely consistent or logical way), the plot built around this was too thin for 96 pages. On the bright side, it had zombies, which is always a plus, but I can't say I enjoyed much else. And even the zombies weren't particularly great specimens. Okay, so destroying the Lazarus Pits somehow stopped and even reversed death, thus the zombie problem, but I didn't really get why that particular horde of disgruntled undead was after Batman. The action sequences were plain confusing sometimes, like when Batman was running from the zombies I had no idea how he suddenly got into the Batmobile again after, or if that even was still the vehicle he started out in earlier that night, which was definitely a car not some sort of glider. Yet later his vehicle could suddenly fly. Traditionally the car can't, right? 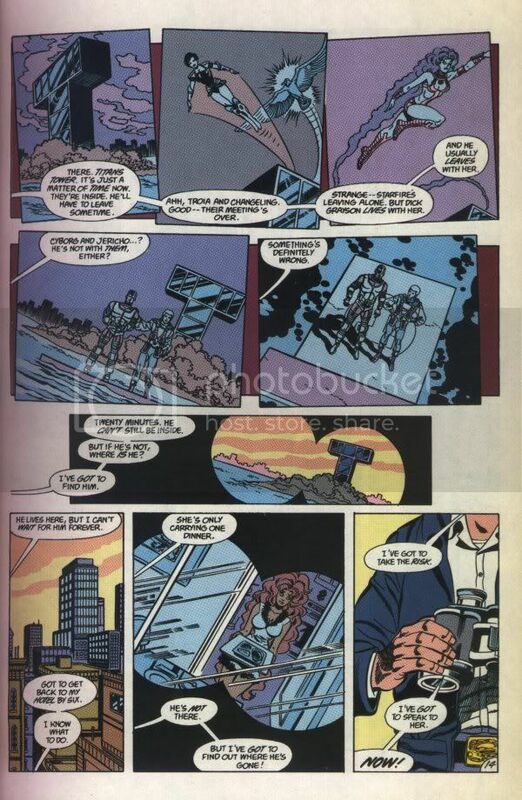 So maybe what he used then wasn't the car, but some magically appearing Bat-Glider or whatever that was supposed to be, that we don't even see him remote call as far as I could tell. Maybe the Batmobile car transformed into a glider. I also didn't understand what happened to the zombies he lured into that supermarket, did he lock them up there somehow? I couldn't tell, later it seemed he did lock them up, leaving them to rampage there, but why didn't they smash the glass? Other times the action was just boring. 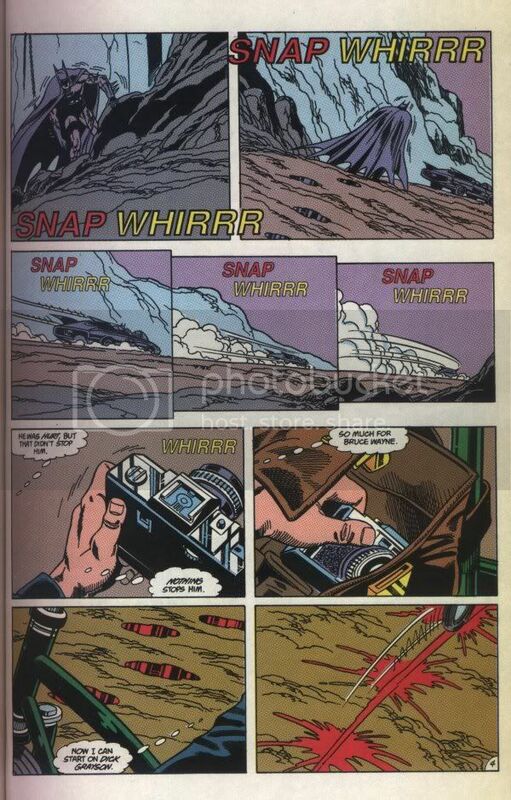 You can tell that a comic has too little plot if it shows a frelling snowmobile chase over eight(!!) pages. Eight. I like certain kinds of action in comics, but snowmobile chases just don't come across that well in this medium. Certainly not if they last eight of the 48 pages in an issue and that on top of other chase scenes. And in a fairly pointless flashback at that. Anyway while we get zombies, we don't really get to see Batman fight them for plain zombie fun, he flies flies around the globe interspersed with boring Ra's al Ghul flashbacks about some magical peach, and then Batman happens to find a monk chanting the Lazarus Pit formula, yet Ra's al Ghul followers were too stupid to figure that out... The whole thing made no sense to me. Overall I enjoyed reading this limited series quite a lot. There were some elements that bugged me (like that hypnotist was cringe-worthy), but in the end those didn't overshadow my enjoyment. 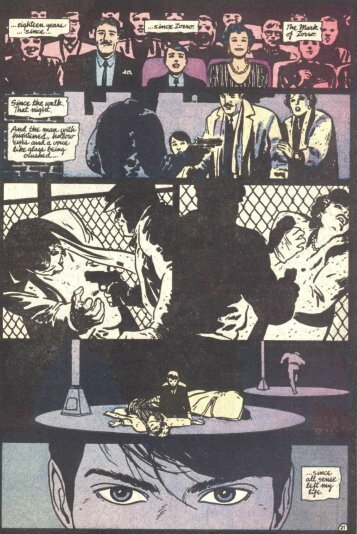 The first major problem of this series is of course that Bruce Wayne's early career as Batman is already kind of "overcrowded" so it is hard to fit yet another thing into the continuity, especially if it covers things that were addressed previously (like Bruce getting involved in Wayne Enterprises) and presents them differently. But if you read with a relaxed attitude and don't view it as a canon puzzle this story is quite cool. I liked that Bruce wasn't yet fully competent and equipped to deal with the criminals he encounters, especially the crazy ones, because he expected to fight "normal" crime. He still makes mistakes and still learns. In some instances he made mistakes that I couldn't quite believe Bruce would make, even this early, and thought he should be more competent, but overall I liked this view. I also liked that he just acted plain younger. I also liked Alfred and Bruce's relationship with Gordon. I could have done without the Joker though. Still, I think it's worth picking up. Notes: thete1 asked for "creaky, leathery, heavily-armored Robins" similar to Bermejo's art in illustrate_me. Unfortunately I can't draw well enough to emulate the style, but I did my best to make Robin's costume look heavy and armored rather than spray-painted on. If you are interested in the unfinished stages, you can also look at the initial pencils, and the finished, but uncolored lineart. Here's the pencil drawing I posted yesterday cleaned up and colored in GIMP. It's Tim as Avatar from thete1's Intimates series. All kinds of critique/comments are welcome. I've colored the pencil drawing I uploaded last night. I don't have a lot of practice with computer coloring and it kind of shows, but I like the illustration still better in this version. 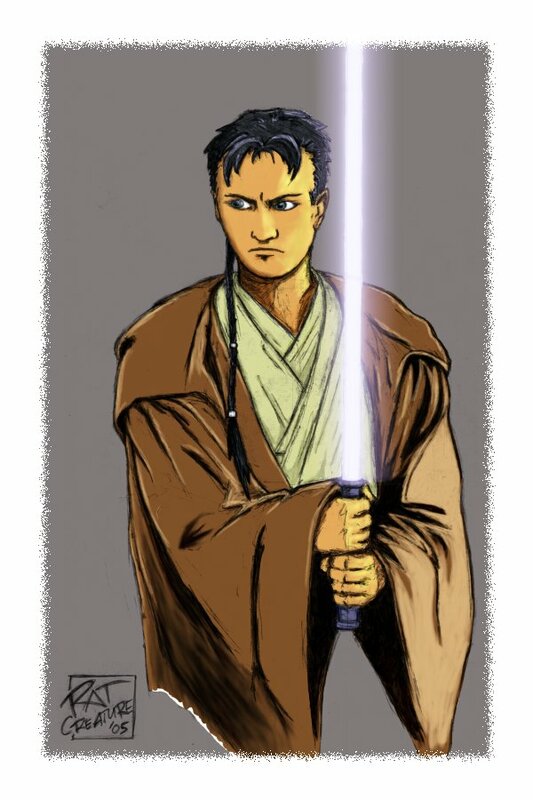 In case you missed the explanation yesterday, this is fanart for monkeycrackmary's SW/DCU fusion story Flamebird, showing Tim as Jedi Padawan. ETA: The LJ picture servers are still a bit obnoxious/slow because of the recent move. If the image doesn't load for you, you can look at it at my site too.